Ok. So here are my two cents for what it’s worth. There are a large number of people who have decided to support Chick-Fil-A and Dan Cathy, the CEO of the company, today with a blitz of consumption. 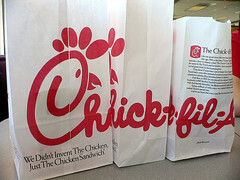 I will tell you that I agree with and support Mr. Cathy’s in support of “traditional” marriage. I put the word tradition marriage in quotations because it is ridiculous that we have now qualify what we are talking about! Supporting Chick-Fil-A does NOT equal supporting Jesus. Some may be saying, “Well that is just ludicrous. Who would ever come to that conclusion?” I’ll tell you who. Every person who looks at the church and at Christian’s and sees this “Chick-Fil-A Appreciation Day” as another example of Christian’s banding together against something. I have already seen some of the insinuations in posts and tweets that I have read. I even jested in a tweet about “Christian Chicken.” What I have realized today is that supporting this company does not mean that we are advancing the cause of Christ. We, the church, has once again fallen for the oldest trick in the book. We are again fighting against everything we know is wrong, rather than standing for the one thing we know to be right–that Jesus is the only answer for a world lost in and to sin. What this has become is the easy way for some (not for all) of these folks to say, “I did something because of what I believed. I stood up for truth, the bible, Jesus, the church.” Or whatever they think that this is going to accomplish. Let me tell you something, if God wanted Chick-Fil-A to crumble tomorrow, no number of customers would be great enough to save it. Barnabas Piper called this move by supporters of the restaurant chain a “bold mistake.” He may be right, but for a different reason. Piper doesn’t see how this will help the church reach people who do not find the Gospel appealing or who may be searching. It probably will not. For me however, I think this may be a mistake because by supporting a company we have substituted the King of Kings with the King of chicken sandwiches. Buy chicken sandwiches does not make (I don’t think) Jesus more beautiful, more rejoiced in, more adored than proclaiming the Gospel. We, as a church, have to get our priorities straight. If Jesus is the reason hearts, minds and souls are changed then let us get busy promoting him to our neighbors! If people do not want to buy a chicken sandwich because of what the owner believes… that is on them. Just do me a favor, do not make it about Jesus. He’s never had a chicken sandwich and may not even like the Polynesian sauce. Victor, I agree with what you’re saying here. It is indeed a shame that we must qualify the word marriage. While I haven’t seen any posts about Chik fil a speaking of Jesus I’ll have to say that quite often the words I read about someone talking about the demise of Christian principles in America, they seem to be more concerned with their abridged “rights” than about the country turning from Jesus. I think that’s where church folks fail at being Christians and make people think that church folks are Christians and turn away from Christ. We’ll call that the Ghandi effect. Victor, I have a lot of respect for the things you write and for your viewpoint. I don’t exactly disagree with you on what I think is your major contention: That political action of any sort, including the event at Chick-Fil-A is not an act of valid worship. On the other hand, I disagree when you say it’s not about Jesus. The Chick-Fil-A I went to was crowded with people who were there because they were Christians and because they viewed what they were doing as a means of making a statement for their beliefs. It was a peaceful, gentle act of political resistance; not church, no, but it was most certainly motivated by their faith in Jesus. As for what others think of this; pffft. Nothing makes you less able to change the world than trying to make yourself so small and your behavior so unobjectionable that no one will criticize you. I don’t advocate doing mean, vicious or hurtful things. But constantly basing your actions on how you think other people will react to them is … well … it’s cowardice. I’m NOT saying anyone in particular is a coward. I AM saying that far too many years Christians as a whole have been cowardly, abject and apologetic about their faith. As for bringing people to Christ, all you have to do is stand for Jesus and preach Christ. You’ll get a lot of flack for this, but if you don’t back down, don’t run away, don’t quit, they’ll come. It really is as simple as that. I may have to revisit this issue in more detail later. But, I do want to make a point of clarification. I have NO problem whatsoever with the folks that showed up at Chick-Fil-A yesterday as a show of solidarity with other like minded believers. I have NO problem with people living out their faith in the public square. I think both of these are good and needed. What I was pointing to are those folks that (and I mean this in a gentle way) took the “easy” way out and may have used this as one of the only ways that they are using to take a stand. Standing in a crowd can be easy. Standing by yourself or in a small group among your peers, at work and family and friends is hard. I agree that cowardice may not be the right tone or word. I would say that for too long the church has been domesticated. The church has lost a good deal of the edge that she had when the Holy Spirit descended at Pentecost. The events with Mr. Cathy and Chick-Fil-A are merely revealing what has, for several decades, gone unaddressed–the church has surrendered too much ground to the surrounding culture. Now that we are trying to take it back, those who are not on “our side” have fortified their positions and are ready for an exchange. Thank you for commenting. You’ve definitely provided food for thought! As always, words will need to be interpreted and clarified. That is the beauty of having a conversation rather than just giving or just listening to a speech/lecture!